Re: Got a plastic classic? Hey speaking of classics, have you ever cruised around in a canal barge or sailing barge? Sort of, yes. When my father retired he bought a 100yr old, sunken hull (with ducks and all) and said 'hey, I'm starting a charter company'. Originally, this was a sailing barge ("Apelo Zeetjalk"). He shortened the hull so she could fit in the French locks (she was about 82' originally, he took a bit out of the middle and ended up with 65' - better for the locks and all the rules and regs for chartering in the Netherlands). Dutch ♀ Liveaboard, sharing an Ohlson 29 with a feline. Really nice shots of the project, thanks for those! An amazing and inspiring resurrection! I wonder if anyone out there is cruising in a Pearson Invicta, or an early Hinckley (S&S) or Alden? Any photos? 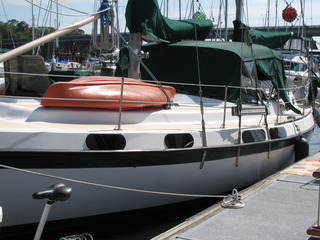 Just came across this one on eBay, Pearson Triton, 1959, hull #16, yawl too! In Virginia. Worth a look I bet! Don't think I haven't been tempted, Don. I'm just not sure how many different P28s I can own! Hey, we got 49 members on the Plastic Classics group! One more and I'll win the CF burgee and a toaster! Ok Don the toaster hmmmmm. Can't pass that one up! We have an Allied 39 designed in 1944 by the Owens power boat people(originally out of wood) and then built in 69 out of glass by Allied. It is an old CCA design which means we pay for a 40' boat and have a 29' water line haha. Have owned Jacaranda for 30 years. Been out since 2005 this trip. We call her a Volkswagen Van. Not fast, not roomy but she gets us there and we share the same view as others in there 200k vessels. Hmm, Yes, Allied 39 does certainly qualify. I think I'll even win a genuine ball point pen with that one! Great to hear from a fellow VW van enthusiast! Send photos! Oh wait, just saw the website, fantastic! And Jacaranda is really beautiful, and rare! 50 members in the Classics group! I win the toaster! But then again, I started a different thread a couple days ago that got 0 replies, so I think I have to give the toaster back for that. I'm gonna keep the ball point pen though! Keep the toaster, apparently the EU has only temporarily shelved banning toasters until after the UK exit referendum(apparently they are dead serious about it). You never know such insanity may be catching, and a toaster could become a precious heirloom. In good news, it does look as if my boat pursuit is over. It's a McCurdy & Rhodes Seafarer 34. Fingers crossed the survey and sea trial go ok. They had better, I have the flight, accommodation etc., booked for next week. Great news! Sloop or yawl? Centerboard? That is a great looking design. Haven't seen one in person yet. It's a sloop Don, and specs say it's the 5.25ft draft fixed keel, but I must admit it's pretty much the only centerboard boat I wouldn't mind having. So I'd be easy either way. Basic, seems well looked after, I think it may be an estate sale as some info is conflicting and I'm getting 'don't know's'. Some were sold as kits, and I think this is one of them (I'm ok with that). I love the design, to me it's a bit like an Endeavour 32's bigger brother. I fly out on the 30th, should see it on the 31st. I'll take piccys. All you folks in the group, don't forget to post some good shots of your boats, including any where you're on the hard. I'm torn between keeping my 1973 Morgan true to the original design, but I've given up trying to keep my old rubber gaskets on my portlights. I've been battling the leaks for too long! 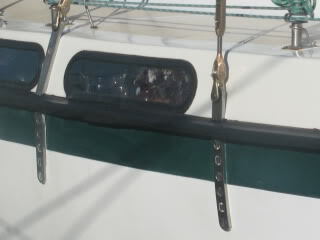 Today I finished replacing all the portlights on my port side with acrylic adhered directly to my hull with 3M VHB4991 double-sided tape sealed with Dow 791. They're a little bigger, but I wanted the added surface area for good adhesion. The compromise with appearance will be worth the tight seal without the rain leaks I've been plagued with!